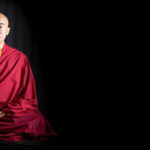 During his retreat in the Himalayas, Mingyur Rinpoche focused mainly on one practice – nature of mind. 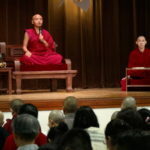 Day to day, Mingyur Rinpoche still practises meditation as it is taught in the Joy of Living programme, for the essence of meditation is awareness. 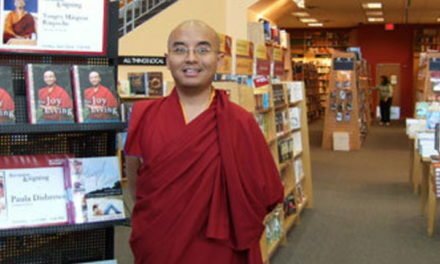 Both Joy of Living and the nature of mind practices go to the heart of Mingyur Rinpoche’s teachings. 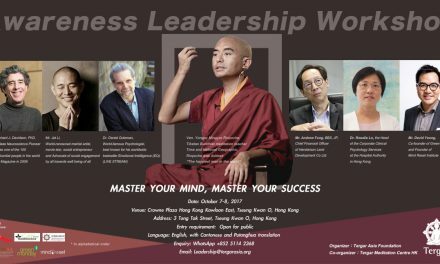 And they will be the two main programmes on offer at the “Tergar Asia 8-Day Retreat”. 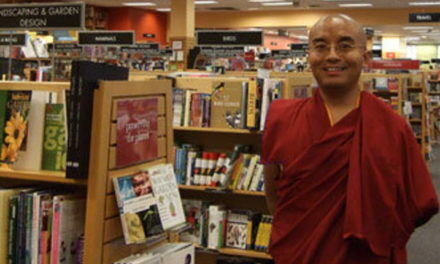 As Rinpoche often tells his students: these are some of the best ways to practice. 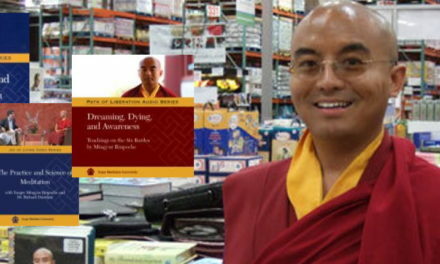 If Mingyur Rinpoche inspires you, come discover for yourself the essence of his teachings. Learn to recognize awareness, unlock your compassion and wisdom, and realize nature of mind – this is a path of practice that will lead you to find the boundless riches of your own nature. 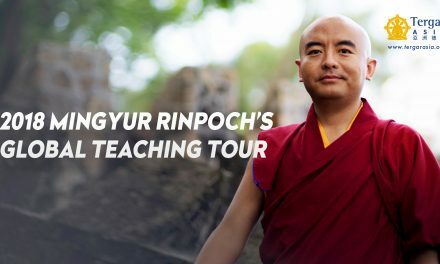 During the eight-day retreat, Rinpoche will illuminate the core teachings and methods, guiding us towards progress in our practice. 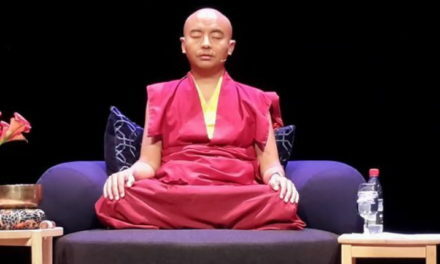 Forgetting to meditate is the only obstacle to meditation, Mingyur Rinpoche says. If you haven’t forgotten it, perhaps you have the small problem Rinpoche often speaks of: being busy and lazy. 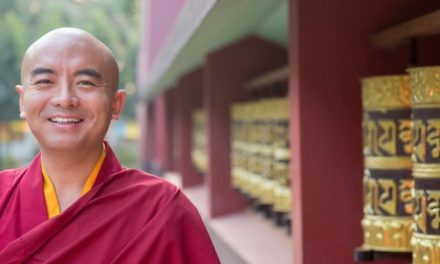 If so, this retreat is for you: let Rinpoche guide you through eight days of intensive work to listen, contemplate and practice. 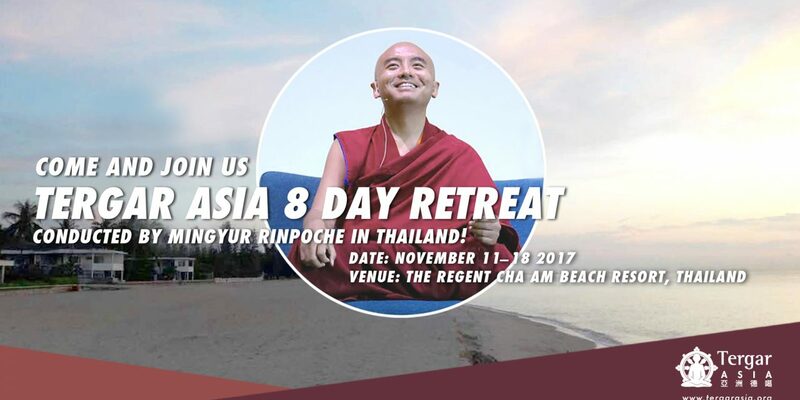 The ”Tergar Asia 8-Day Retreat” is the highlight of Mingyur Rinpoche’s 2017 Teaching Tour in Asia. It is open to all who wish to realize their own nature in order to benefit all beings (subject to entry requirements for some of the courses). Places are very limited. Please check Tergar Asia’s and local Tergar communities’ social media platforms regularly for updates on registration and other details. 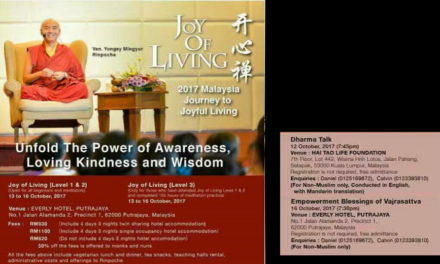 * Awareness, Compassion, and Wisdom: Essential Teachings on the Joy of Living Teachings (JOL 1-3) – welcome everyone can participate. Medium of Teaching: Conducted by Ven. 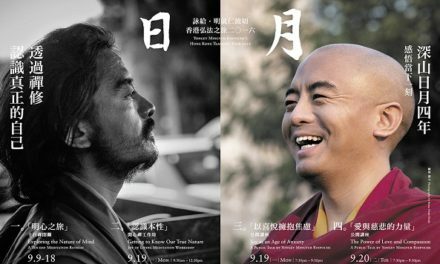 Mingyur Rinpoche in English with Translations in Mandarin and organizer is trying to organise the translation in Cantonese as well. ‧ Organizer will arrange the free shuttle bus from 12:00 noon to 3:30pm from Bangkok International Suvarnabhumi Airport (BKK) to venue of retreat and takes about 2.5 hours. ‧ Organizer will arrange the free shuttle bus to Bangkok International Suvarnabhumi Airport (BKK) after lunch on November 18, 2017 and takes about 2.5 hours. d) Other related retreat expenses. ‧ Organizer will have final decision on the adjustment of room allotment and the room type of registration is subject to first come first served basis. 1. The date of enrolment will be June 25, 2017 to August 10, 2017. Due to limited seats, registration is on a“first come, first served” basis. 2. Upon enrolment, participants will receive the confirmation immediately. To avoid any delay, you are advised to complete the money transfer within appointed payment days and send in the payment advice for early acceptance of your registration. For those participants who has not completed the payment, waiting list participants will be automatically fill up the seat after deadline. 3. After the effective of enrolment becomes, students cannot replace and transfer by their own. For those students who cannot join or leave after retreat started, please contact the local person in charge, the organizers have the right not to refund the fee of retreat. 4. Children under the age of 12, the organizers reserve the right to review and parents should ensure that children who cannot interfere with the retreat. If the interference of other students, the organizers have the right to ask the children and their parents to leave. 5. To participate this retreat, it is necessary to hold their student card for admission. Undocumented persons are not allowed to enter the venue. · For cancellations by September 10, 2017, an administration fee of USD150/HK$1200/RMB1050/NTS4650 will be charged. · For cancellations after September 10, 2017, all fees are non-refundable. 7. The retreat content or schedule is subject to Ven. Mingyur Rinpoche’s final decision and may be changed without prior notice. 8. 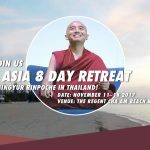 The retreat fees do not include any offering to Rinpoche and the Sangha. Participants are welcome to make their offerings at the end of the retreat. In order to let you know the contents of enrolment form, please refer to the following preview link of Hong Kong registration system. Similar required information will be requested from the system of different countries. Please contact all Local Tergar Communities in Asia for enrolment. Following contact and links will be opened for registration at 12:00 noon on June 25, 2017.